Creative Design, Quality Craftsmanship & Superior Service! 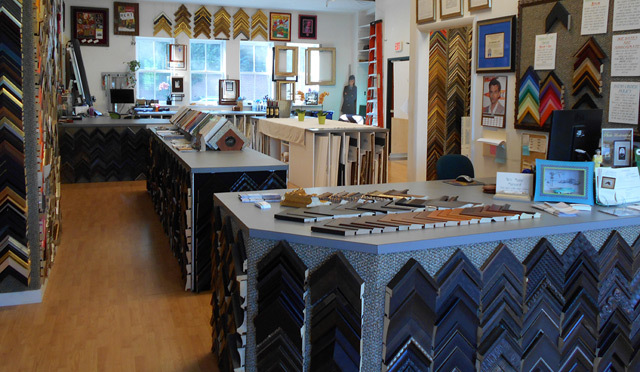 At Applegate Gallery, we pride ourselves on providing quality picture framing for all your artwork; your one of a kind painting, your favorite poster or family photo, your new diploma or an award that took years to achieve. 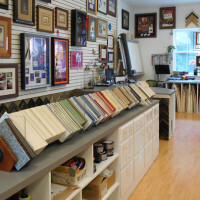 We offer unique and creative picture framing designs to showcase and preserve your memories and heirlooms. 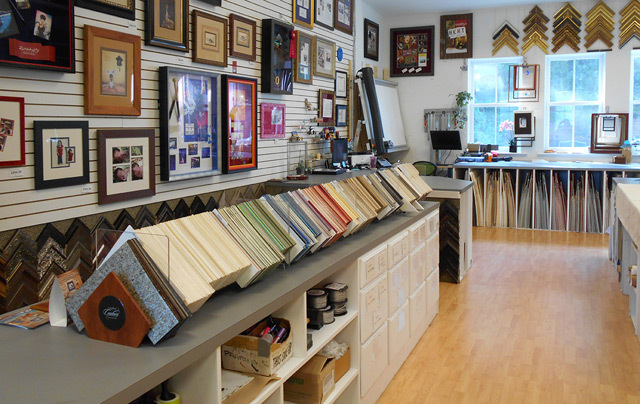 We are here to assist you in designing the perfect combination of matting, frame and conservation materials to beautify and protect your personal treasures. We offer personal one-on-one assistance, incorporating our clients’ personal style and vision in each custom project. 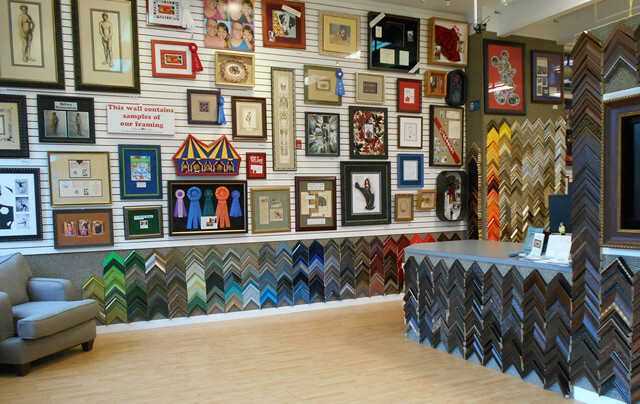 All custom framing is executed on the premises by our expert framers. 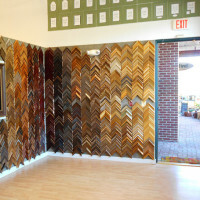 We give free estimates on all framing projects. 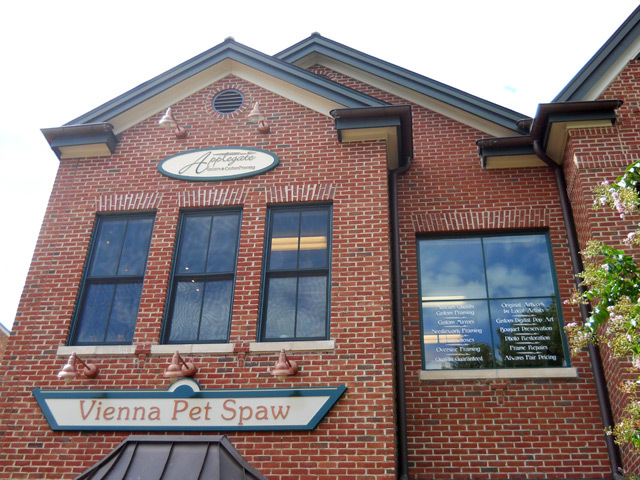 View our Past Project Showcase to get ideas or play with our online Design Tool to see your project virtually framed! Our award-winning designers will guide you through the frame design process, helping you choose the materials that best enhance your artwork and your decor. We work with you to create a finished product that not only suits your needs and budget, but that will be stylistically versatile for years to come. We pride ourselves on our creativity, and we want you to love your project! We follow proper preservation practices to ensure that your project can be displayed & enjoyed for a lifetime. 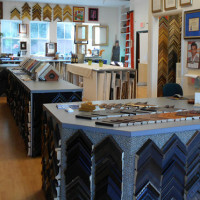 Our hard-working staff has years of hands-on framing & design experience. Applegate Gallery uses only the best conservation materials to protect your framed project, like acid-free & museum-quality mats, and UV-protected & museum glass fromTru Vue. We don’t settle for ‘good enough’ – our quality is the best! 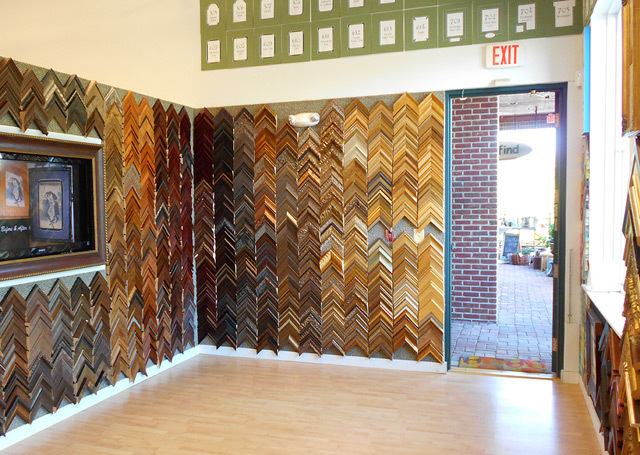 Applegate Gallery has a huge selection of custom frame mouldings! 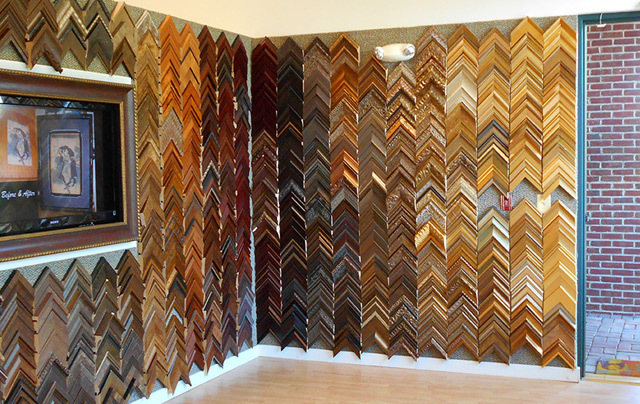 With hundreds of frame corner samples and mat choices, we can create the perfect framing design that’s just right for your artwork. We have a complete style range from contemporary to traditional. Choose from fabric mats like linens, suedes, and raw silks, and hundreds of fillets to add the finishing touch to your masterpiece. Nothing is more important than your trust in our service. 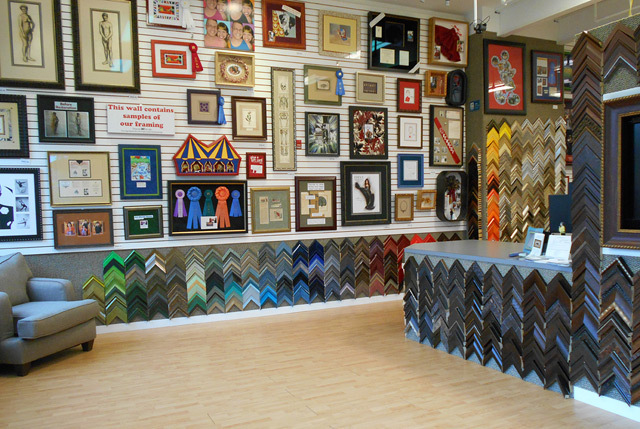 That’s why Applegate Gallery & Custom Framing offers the most aggressive guarantee of satisfaction in the industry. 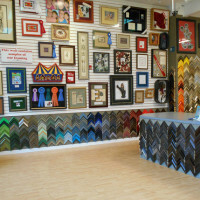 Proper custom framing is vital to showcasing and protecting your artwork. Our expertise, certification, and success with pleasing customers allows us the confidence to eliminate any risk when you use our service. If for any reason you are not completely happy with the design of your project, return it within 14 days and we’ll redesign it without additional charges. * Craftsmanship and materials are covered for the life of your project. *We will repair or replace any portion of the project that exhibits a defect in materials or craftsmanship. Coverage does not apply to damage caused by abuse, transportation, or exposure to the elements. Applies only to materials and workmanship provided by Applegate Gallery. Anything can be framed. Two-dimensional artwork is only the beginning of what is possible in framing. Many of your most prized possessions can be shadowboxed including christening gowns, antique jewelry, flags and wedding mementos. Having these items in a drawer means you aren’t able to enjoy them, why not have them protected and displayed so that you can see them and share them with people? Anything that is important to you, anything you find beautiful or pleasing to look at, is worth framing. It does not matter if the artwork was expensive or expected to raise in value. A 99 cent gift card can look like an expensive piece of art when framed properly. A very sentimental gift, no matter how small or inexpensive, can be beautiful and unique when shadowboxed. A child’s artwork can be a very special display framed in your home and is important encouragement to the budding artist. There is no appropriate ratio for cost of framing to value of artwork, what you choose to frame should be based solely on the importance of the work to you and the enjoyment you get from viewing it. How should mats and frames be chosen? It is important for the framing of a piece of artwork not to distract from the work itself. This can be accomplished in many ways for each and every piece of work, there is no one correct answer to choosing your materials and colors. The ultimate goal is to have framing which looks as if it belongs to the artwork. A white mat and plain black frame can be just as distracting from the artwork as the choice of an inappropriate color can. 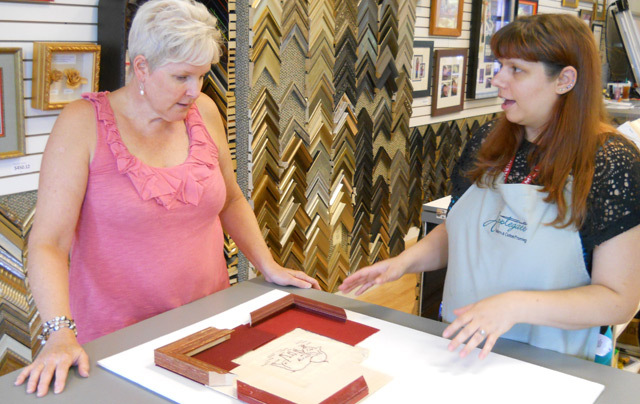 An experienced framer can help guide you to the frame and matting which compliments your work as well as your own personal taste. What is the purpose of matting? 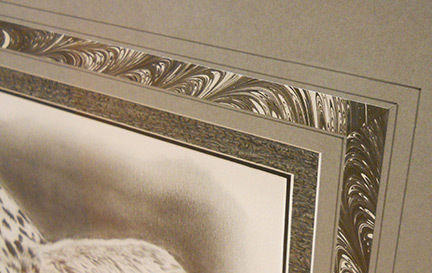 The reason for matting is to provide the viewer a place for their eye to rest around the artwork. It removes all distractions from the enjoyment of the work itself. A mat which is too small can create a distraction in itself by causing you to see a stripe around the artwork which is the first thing you notice when viewing the piece. Your mat should be larger than the width of your frame with under-mats of varying sizes to avoid a distracting stripe effect. What is the difference between regular matboard and acid free matboard? Regular mat board, also called paper mats, are made from wood pulp. Wood contains a great deal of acid. Acid will do long term and permanent damage to your artwork. Proper mat board, sometimes called archival mat board, rag mat board, or acid-free mat board, is made from cotton rag. Cotton is acid free and PH neutral. Why should I replace my acid mats? Acid Mat Board is made from wood pulp. The acid in the pulp will, over time, yellow and eventually eat into your artwork. How long this takes depends on the artwork itself; some pieces will take 10 to 20 years to yellow and be damaged while others will show damage in a matter of months. Some framers will put an acid mat above an acid free mat under the belief that by having a barrier between the mat and the artwork you are protecting the work from the acid. This is false! The paper below your matting will be protected from the acid, but the visible part of the artwork (the most important part) will be affected by an acid gas which is expelled from the bevel of the mat board. If you love the work enough to frame it, you should protect it from damage! Acid free mats are made from pure cotton pulp, which contains no acid and nothing which will alter your artwork. Why do I need glass over my artwork? With very few exceptions, artwork needs to be protected from the elements and glass is the best way to protect it. Uncovered artwork is exposed to dust and dirt in the air, and most artwork cannot be cleaned without smearing or damaging the piece. Your work will also be exposed to moisture, which in our area is highly prevalent. 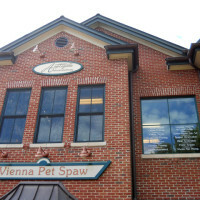 Why should I use UV protective glass? All artwork is affected by UV light. This does not only occur when the art is being struck by direct sunlight from a window. All lamps in your home release UV light. Florescent lights in your home will affect your artwork approximately 40% slower than direct sunlight. Incandescent houselights affect your artwork 60% slower than direct sunlight. The only way to avoid any UV light on your artwork is to have it in a box placed in a closed drawer locked inside a closet. The next best thing is UV protective glass. Conservation clear glass looks like ordinary glass but has a filter which blocks 99% of UV light from reaching your artwork. This will prolong the richness of your work (as well as the monetary value). Why shouldn't I use non-glare glass? Non-glare glass (also called non-reflective glass) is made by sandblasting glass on one or both surfaces. The effect of this is to spread the reflected light across the glass by bouncing it off of the textured surface. This is sending the light in all different directions instead of sending the crisp reflection back to the viewer. 1) This is a great idea except for two things: the texture of the glass makes the glass less clear. Directly against the surface of your artwork, you will lose some detail from your image. The further the glass gets from the image, for example if you are using mats, the less detail you will see. In a shallow shadowbox of ½” you will see nothing but a vague blur of colors. 2) By spreading the reflection in different directions, you may end up with your entire piece looking like a white rectangle. In large amounts of light, the wide spread can cover your whole piece and obscure the art completely. Museum glass is a fabulous alternative to the non-glare glass! Museum glass has a coating which makes the glass invisible from most angles. All glare and reflections are non-existent. In addition, this glass has a coating which filters out 98% of UV light and protects your art form fading as well as conservation clear glass. It does cost more than conservation clear glass, but it preserves the appearance of your unframed artwork, including the richness of color that any glass can subdue. Why shouldn't my art touch the glass? There are two problems which can be caused by artwork touching glass. First, the glass can stick to the artwork. I have in the past had to reframe a work of art along with the glass which is stuck to it. Once the glass sticks, the artwork will tear if you try to remove it. Second, the suction created between the artwork and the glass can attract and collect moisture from the air. When this happens, the artwork can begin to mold. Molded artwork can be repaired, but usually at a great cost through a conservator. With the high humidity in our area, this molding happens often. The only artwork I would recommend framing with glass directly on top of it are posters which are easily replaceable and photographs for which you have the negatives and the ability to reprint. Should I use matting on my painting? Paintings should not have matting because matting requires glass to protect it and paintings require the absence of glass to allow them to breathe. Instead of matting, a painting can be framed with a larger frame for more effect of a liner can be added to the frame to serve a similar purpose to matting. Why shouldn't my paintings be nailed into the frame? Many frame shops and artists alike nail through a painting’s stretcher bars directly into the frame. This causes two problems. One is that the painting is held so tightly in place, it no longer has the ability to expand and contract. Paintings normally do this with changes in temperature and humidity at a slow rate not noticeable to the naked eye. Even though you can’t see these changes, they are very important to the painting and not allowing them can cause the canvas to buckle. This can manifest as something as displeasing to the eye as a rippled or buckled canvas or, more seriously, as paint flaking and peeling away from the canvas. The second problem caused by this practice the the holes put into the canvas by the nails themselves. Even a minor hole can decrease the value of the painting; but in many cases the hole will enlarge or even tear into the image area. Any attempt to reframe the canvas, if for example it is sagging on the stretcher bars, can cause it to rip further and ruin the artwork. What are French Mats and when should they be used? French matting is a very old and treasured technique which few people today are still trained in. The mats are decorated with ink lines, powder panels and strips of marbled or handmade paper. A French mat can be used on any artwork and can give the piece a more antique or more traditional look; but they can also be used to emphasize a modern piece with some extra character. A proper French mat is done by hand and is a work of art in itself. How should I frame a jersey or t-shirt? Jerseys and t-shirts need to be framed without touching the glass, which means a shallow shadowbox frame. If they are pressed to the glass, moisture will collects and cause the fabric to mold. The best way for a jersey or t-shirt to be mounted is to sew it down to a fabric backing which has been drymounted (adhered with a heat-activated glue) to foam board. This makes sewing the piece down very easy and secure. Sewing is done with invisible thread, similar to a thin fishing line, and will not distract from the artwork itself. This also means that the mounting is completely reversible and does not damage to the piece. Valuable pieces, like a signed jersey, will have no decrease in value. We also now offer shadowbox frames for jerseys in both child and adult size which are shaped like your jersey. The jersey shaped boxes come in styles to fit football, basket ball, baseball and hockey style jerseys. The child sized football shaped jersey box is also appropriate for t-shirts. When should I use a spotlight on my artwork? Spotlights should never be used on your artwork. Besides the UV light that you are directing towards your artwork, even the highest quality spotlights will not light the entire work of art. You will end up with a bright circle or strip on the art as opposed to having the entire work evenly lit. What is drymounting and when should I drymount my artwork? Drymounting is a way of attaching your artwork to the backing board using a thin tissue of adhesive which turns into a glue when heated. Some drymount tissues will be labeled as reversible and acid free, but they are only truly reversible by a conservator which will cost you a great deal of money. There are however newer drymount boards with adhesive already on them which is completely reversible by your framer. These boards use lower tempetures and shorter times in the press, so they are safer for your artwork. Drymounting should not be done if not needed, but when it is needed it can smooth out even the most warped and rippled pieces of artwork. It is also smart to drymount newspaper articles, since their paper is highly acidic and will deteriorate with time unless stabalized by gluing to the board.